European subscriptions to the American Skeptical Inquirer are handled here. These are fulfilled by The Skeptic from the UK. If you wish to order copies of The Skeptic, please do so in a separate transaction. The price includes postage within Europe. 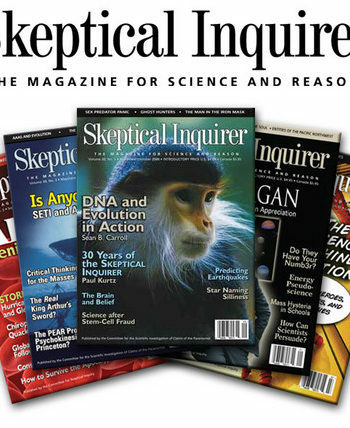 For a fast-growing number of discriminating persons, the Skeptical Inquirer is a welcome breath of fresh air, separating fact from myth in the flood of occultism and pseudoscience on the scene today. This dynamic magazine, published by the Committee for Skeptical Inquiry, tells you what the scientific community knows about claims of the paranormal, as opposed to the sensationalism often presented by the press, television, and movies. Renewing subscribers will need their account number which is at the top left of your mailing label.